Only having two baskets or even four baskets in a gym is a common occurrence in many youth and even high schools gyms. This is a challenge that many coaches must deal with. As coaches we want players to be getting as many quality reps up as possible and often times gym space and number of baskets is the biggest hindrance. Ideally we would all have large gyms with several courts and baskets, but the reality is much different for many coaches and schools. However, there are ways coaches can overcome these challenges and produce high quality practices where players are getting up several reps. Shooting is an aspect that many coaches like to work on, especially at the youth level. Ensuring players are getting up plenty of shots goes a long ways in the development of a player. When in a gym where there may only be two baskets and 10-20 players, getting up enough shots can be a daunting task. Form shooting, motion shooting and cycle finishing are some of my favorite ways to get up plenty of reps when with a large group or limited baskets. Of course, having a Dr. Dish or two available is a complete game changer for maximizing reps.
Motion shooting is a great way to incorporate multiple skills such as dribbling, passing and shooting into a drill while working on actions within your specific offense. Whether you run a 3 out, 4 out, 5 out or continuity offense, you can set up the drill so players practice specific pieces of the offense while getting up shots they will see in games. Small sided games are the best way to have players work on games skills while also getting up plenty of quality reps along with coaching. Breaking your team up into smaller groups of 2s, 3s or 4s will allow for players to get more touches and allow coaches to script specific things they would like to work on while also playing a game/drill. I have even heard of and been in the situation where somehow you must practice in a small space without any baskets. This can be a really frustrating situation for the coaches and players. Although I would work hard to never this situation or at least try to avoid it as much as possible, you can still have a productive practice with limited space and no baskets. This is a chance to focus in on the fundamentals of ball handling, passing and defense. Coaches can break down ball handling and passing and work on it in isolation with several drills that we all know. To add on to this, there are several ways to make it more challenging and add decision making to ball handling and passing. Adding a defender or defenders makes ball handling and passing more game-like and adds challenge to drills. In turn, when you add a defender, this can be an opportunity to work on defense. Lane ball handling, box passing and knockout are some examples of drills with defense that you can do with limited space. Many youth coaches are often practicing in spaces that are not ideal. This can be frustrating for all parties involved, but there are ways to combat these limitations and still produce high quality practices. In these situations it is important to be creative with your practices and always come prepared ahead of practice, but be willing and able to adapt a drill to the space. 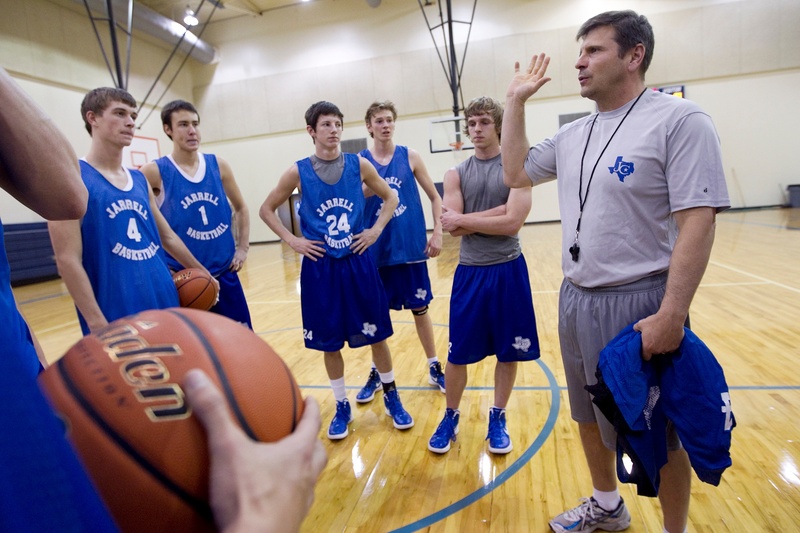 When there are challenges like space or baskets, it is a great time to grow as a coach. By adapting drills to the space and players you will become a more efficient teacher as well.